Mrs Dry, Mrs Fleming, Miss Walker and Mrs Bailey. P.E is every Thursday so please ensure that your child has a NAMED P.E kit in school. We find it is best to keep the kit in school for the half term and take it home to wash for the holidays. If we feel it needs a wash sooner than this we will send it home. Reading books are to be returned every Wednesday this gives teachers time to read and respond to reading record comments and return with a new book every Friday. This will start week commencing 14th January. Please could you try and ensure that ALL items of school clothing are named. We have a large amount of cardigans and jumpers in school with no name on. 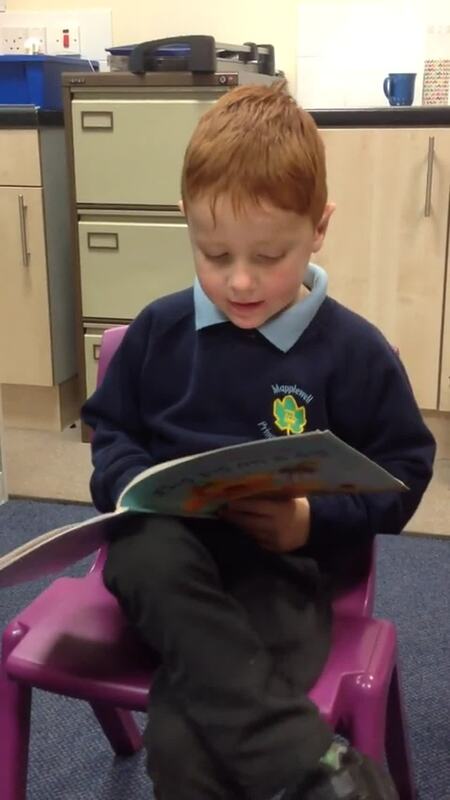 Two pupils have amazed us with their fantastic reading this week. They brought in books from home and read them aloud to the rest of the class. 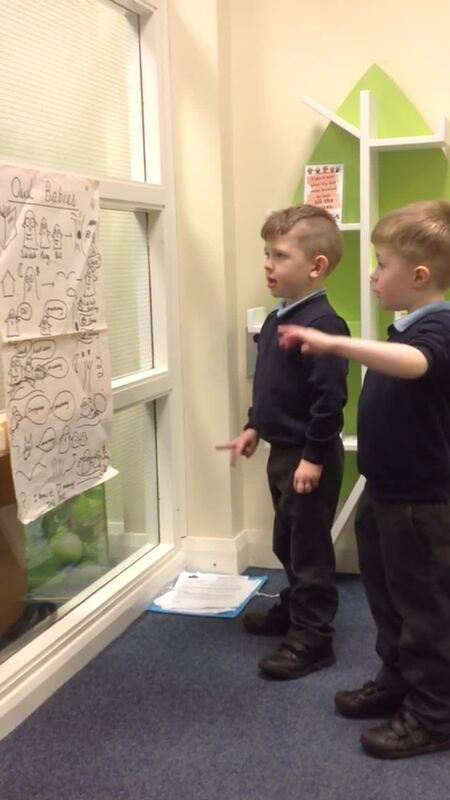 They showed that they could use the pictures and their phonic knowledge to tell a story. This is just the beginning of their reading for pleasure journey! Our challenge to Jackalopes class is to see how many more pupils can start their reading for pleasure journey. Find a book you love and see if you can retell the story using the pictures and phonic knowledge to read the text. If you are on twitter make a video and share it. Make sure you add @MapplewellSch so that we can retweet it. If you are not on twitter bring the book to school so that we can celebrate reading for pleasure in school. We have been very busy this week learning about money. We have begun to recognise different coins up to £2 and find different ways to make small amounts using coins and Numicon shapes. 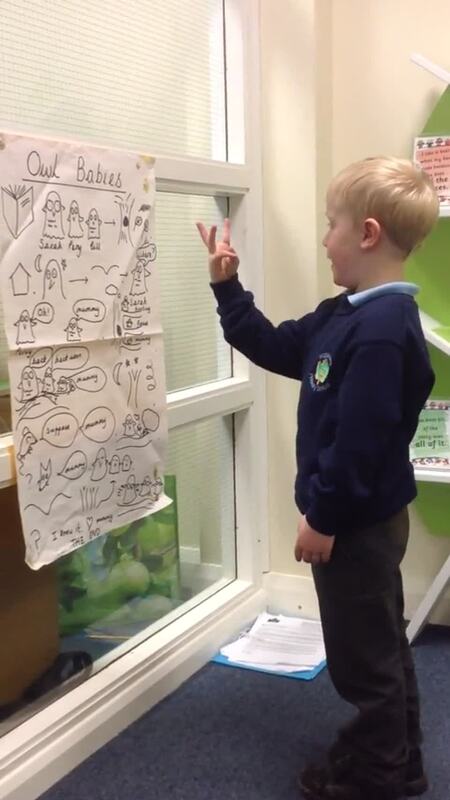 This has been useful for when we are playing in the farm shop in our role play area. Outside, we have used cereal and pipe-cleaners to make bird feeders. We are looking forward to watching the birds eat them. We have also been very busy in the creative area and we think that our mummies will be very happy on Mother's Day. We have started to look closely at how the plants are changing now that we are in Spring. Please ask us about the things we have noticed. We have also had lots of fun playing with our friends and enjoying the sunshine. This week we have been busy halving numbers in maths. We have been using different resources to find out half by sharing them out with our partners. We have also been cutting the Numicon shapes in half and finding out the shapes with an odd one on top can't be cut in half. We have also noticed the relationship between doubling and halving. In P.E we got the mats out and worked in 3's to roll across the mat in different ways. We made our bodies long and pointy as well as small like a ball and rolled across the mat. We also practised forward rolls and some even tried backwards rolls which can be quite tricky. We have been making the Enormous Turnip. We used mod rock and chicken wire to sculpt the turnip. We had to wet the mod rock and smooth it onto the chicken wire frame. The plaster or Paris then set very hard. After that we mixed primary colours red, yellow and blue to make purple, orange and green and painted our turnip. We can now use it in our role play. We did some amazing writing about the story and sequenced the characters in the correct order. The moral of the story is about everyone working together as a team to achieve a shared goal. It has been a busy week with two big celebrations. Pancake Day and World Book Day! We started the week finding out how to make pancakes and we then discovered what happens when you mix two ingredients together. The eggs and flour did not look right. The batter was too lumpy. So we then added a little bit of milk and gave it a whisk. We kept doing this until we thought the batter was smooth and ready. Once the pancakes were made we then cut the pancakes into two halves and then into 4 quarters. This meant we could test different toppings. The choices were jam, lemon, honey or plain. Everyone tried each topping and then wrote their favourite on a paper pancake. We then made a pictogram to find out how many people liked each topping. We then did lots of counting and comparing. Later this week it was World Book Day. We came to school dressed as a book character and brought a book to swap. It was tricky choosing a book to swap as there were many new stories that we wanted to read. We also made bookmarks and read lots of stories in the reading area. We have also had lots of fun outside building dens and working out how make our dens more sturdy in the wind. This involved making hard tops for our dens using the large planks. We have had to modify our dens and be resourceful with the materials we have so that more people wanted to fit in. This week we have had lots of fun exploring length using different standard and non-standard measures. We were astonished to find that several dragons had left their footprints in our outdoor area. We used plastic animals, sticks, footsteps and handprints to measure how big they were. We thought that the big footprints might belong to big dragons. We also enjoyed using trundle wheels to find out how long different dragons were. Then we identified how many children were the same as these lengths. Some dragons were as long as 18 children! As part of our topic about Spring and Growth, we have read the story The Enormous Turnip. We have enjoyed creating our own actions to retell the story. Our home corner has been transformed into a farm shop and café so that we can buy and sell vegetables and other items. We are looking forward to seeing everyone in the morning. Our new topic will focus on Our Planet and in maths we will be learning about 2D shapes, addition, subtraction and measure. If your child would like to bring in something they can talk about linked to Our Planet such as recycling, the environment, what our planet is like and the animals that live in our world. Things can be brought in on a Monday or Friday. Here are just a few of the wonderful things the children have brought in to show us. We have been learning lots of interesting facts about bats, giraffes, lions and panda's. We will be learning the stories with the Talk 4 Writing actions for "Owl Babies" by Martin Waddell & Patrick Benson and "I'm not cute!" by Jonathan Allen. We have been practising the Owl Babies story at school and at home this week. What fabulous story tellers we are! We have been using our phonic knowledge to write independently this week. We have been trying hard to remember finger spaces and using red word 'I' that we have learned in out RWI lessons. Look how we are beginning to sound out words to spell them phonetically. We had an amazing visit from Steve at Yorkshire Owl Experience. He taught us about different species of owls. We learned that an owl nest is called a scrape and we saw owl eggs and owl pellets. He told us that because owls cannot digest bones and fur they spit them out as a pellet. We saw Casper the Indian Eagle Owl, Jack the Barn Owl and Charlie the Tawny Owl. We have been writing letters of thanks to Steve for bringing in his owls for us to look at. We have been using Numicon to add this week and writing calculations carefully, trying hard to form our numbers from the top, one per square. 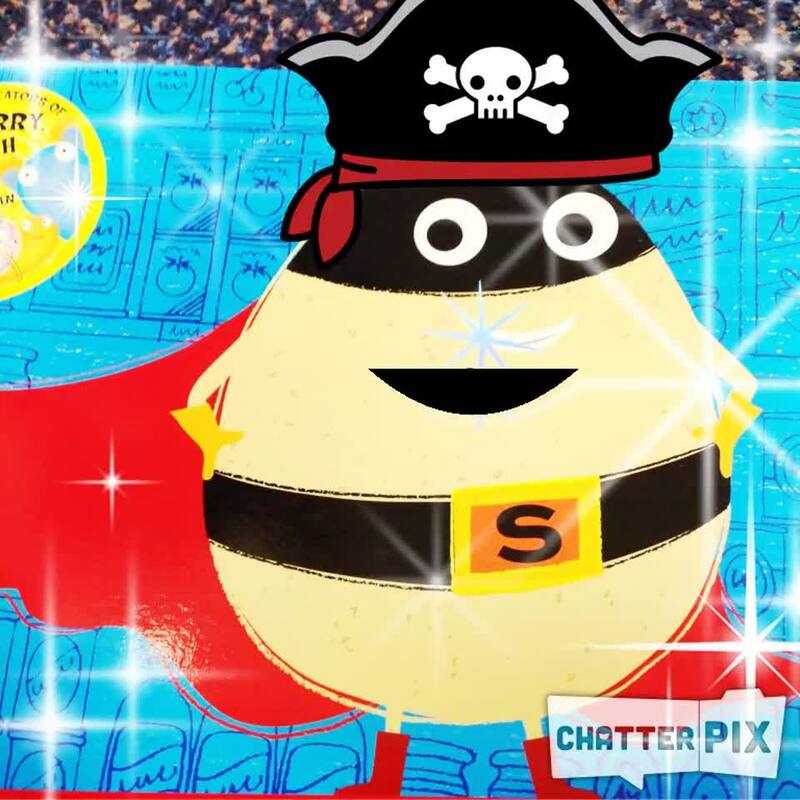 This week we Supertato and the Evil Pea have visited our class. The Evil Pea has taken some of the sprouts hostage and is threatening to put them in the deep freeze unless we can estimate how many sprouts he has captured in the jar. As part of our learning about measure, we have used pan balance scales to compare the weight of different vegetables and have ordered them from lightest to heaviest. We have also made puppets of the characters from the Supertato story. 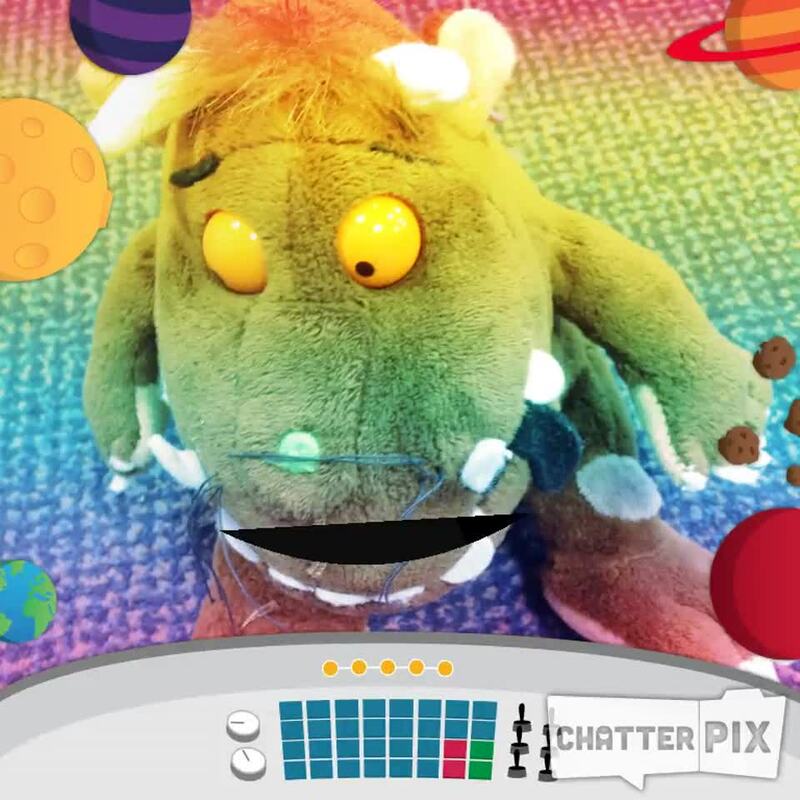 We have also had lots of fun making different toys talk and sing using the ChatterPix Kids app. 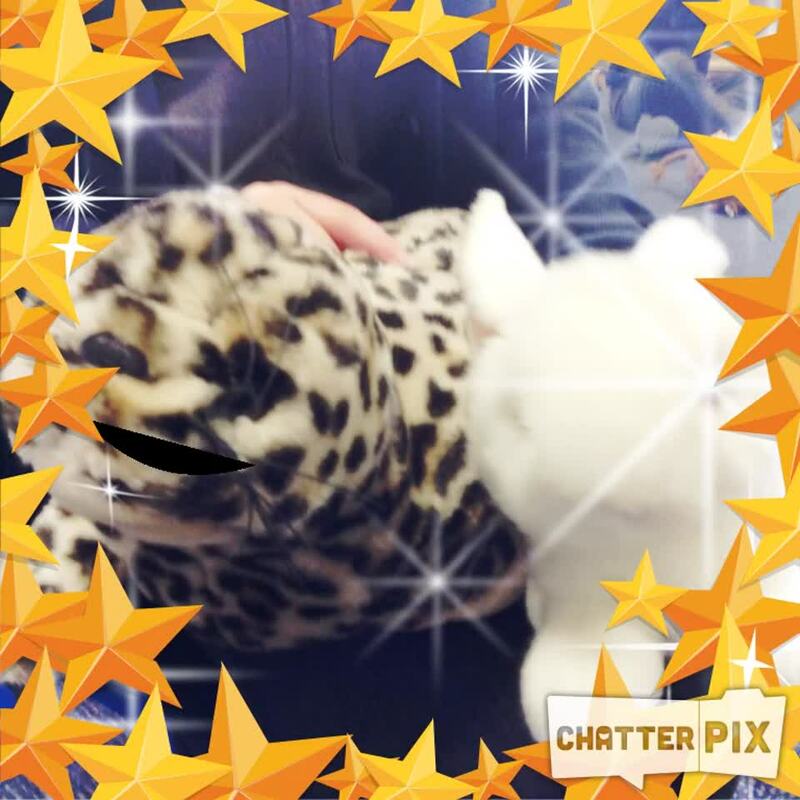 Have a look at the talking avatars that we made. We managed to free the sprouts and save them from the Evil Pea. We did lots of estimating and one pupil managed to correctly estimate 19 sprouts had been captured in the jar! We have also been busy exploring different vegetables, naming them and using our senses to compare them. We were then busy peeling, chopping an grating some vegetables to make a soup. It was hard work chopping, some vegetables are very hard and we had to use the muscles in our fingers and hands to try an chop them. We talked about how to hold a knife and to be safe when cutting food. We shared stories about how we help make things at home with our families. We can't wait to try the soup! 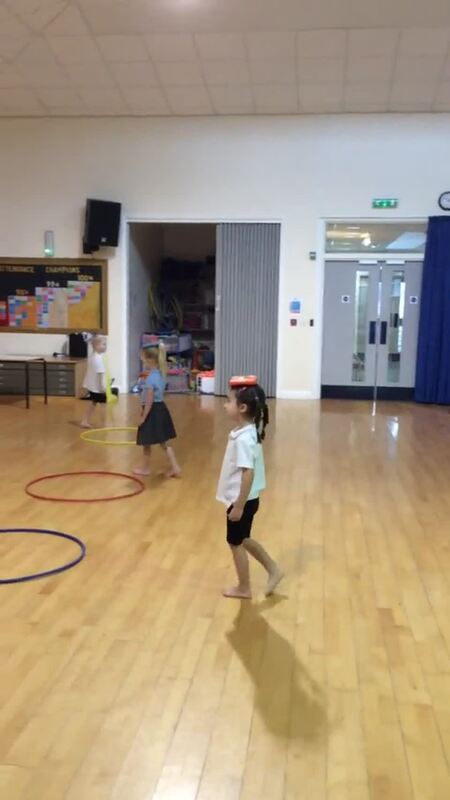 This half term in P.E we have been focusing on team games which included ball skills and this week we focused on balancing. There was some really good concentrating and balancing. Take a look at the videos to see how well we did! This week we have started to learn about subtraction. We have explored subtraction by counting backwards on number lines; taking apples off the apple tree and using Numicon covers to show that that number has been taken away. Our teachers have been very proud of our learning. This half term we have spent time talking about the weather and what is the same/different each day. On Wednesday we were amazed by the heavy frost on the ground. Just before lunch, we went outside for half an hour and explored the frost on the ground and the solid ice in the water tray. We even discovered that some of our sand was frozen! We really enjoyed crunching in the frost and touching the ice and frozen sand to explore the different textures. We have also used construction materials to make different robots. Mrs Dry brought us a remote control toy to play with. 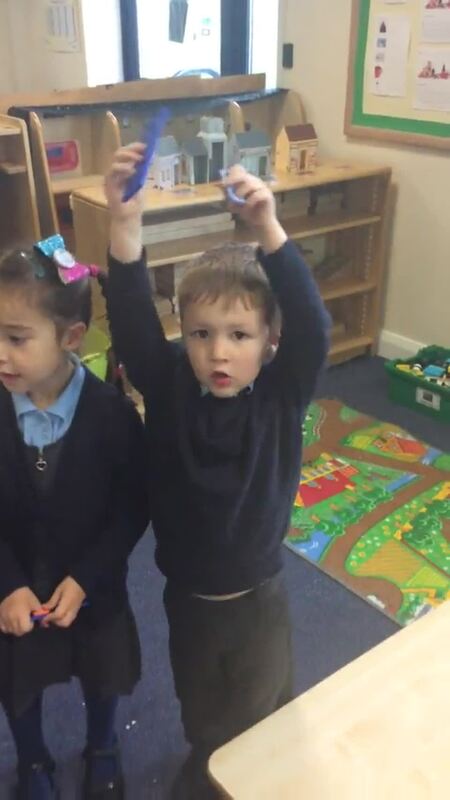 We have had lots of fun using the remote control to make the toy move in different ways. We have had a very exciting time this week learning to make simple electrical circuits. We used a bulb, bulb holder, wires and battery to make a simple circuit that lights up. The crocodile clips on the end of the wires were a little bit tricky but this was excellent practice for our fine motor skills. In maths we have used lots of different apparatus to further develop our addition skills. We have used Numicon shapes to make different pictures by looking carefully to see which shapes will fit together to make the total in the picture and we have used Numicon rods and dice to practice adding two amounts. The weather has been quite sunny for most of the week so we've been able to play outside. We are really enjoying playing football; building different vehicles and homes (including ones that fly) and riding the bikes and scooters. In RE we have been learning about the Bible story Noah's Ark and we are learning to sing the song 'The Animals went in Two by Two.' I'm sure if you ask, we will sing this for you at home. We will continue to learn more about the story next week as it links to our topic about Our planet. What a lovely first week back we have had. We have been busy sharing all our news from Christmas and drawing pictures of our favourite presents and talking about special times with our families. This week we have enjoyed playing with our friends and being creative with junk modelling materials. They have enjoyed playing and exploring in the water area and catching up with our friends in the snack area. We have also started reading our two stories we will be focusing on this half "Owl Babies" and "I'm not cute". We will be learning the Talk 4 Writing actions over the rest of this half term. In maths we have been focusing on 2D shapes and their properties. We were also looking at different shapes in the environment and being able to describe their position. Friday Reward Time - We went on a welly walk and enjoyed climbing and sliding. This half term our topic is linked to Festivals and Celebrations. We have started by celebrating Bonfire Night and will also find out about the Hindu festival of Diwali and the Jewish Festival of Hannukah. We will then be find out more about Christmas and the birth of Jesus. alongside this we will be getting ready for winter and exploring the theme of Winter Wonderland and will link to our trip to Barnsley Civic to see Jack Frost. This is our Key Story this half term. Lost and Found by Oliver Jeffers. Your homework is to listen to your child retelling the story using Talk 4 Writing actions. We have had a very busy week. On Monday we went to Barnsley Civic to see Jack Frost and on Thursday we welcomed our parents and grandparents into our class to look at our amazing Learning Journeys. We also enjoyed a lovely Christmas dinner and had lots of Christmas activities. We enjoyed our Christmas Party on Friday. We had hotdogs and chips followed by ice cream. We then played party games in the hall. We have had great fun acting out the Nativity Story in our role play area. King Herod stole baby Jesus and Mary had to phone Joseph to help her get him back. An angel assisted the rescue and luckily by tidy up time baby Jesus was safely tucked up in the manger with the penguin from the Lost and Found story. We have enjoyed other Christmas activities this week, including sleigh building in our outdoor area. On Wednesday we performed our Nativity to the Residents, visitors and staff of Mapplewell Manor Care Home. They thoroughly enjoyed the performance and all the children received a bar of chocolate as thanks. Thank you to all the parents who attended out Nativity at St John's Church. The children were fantastic. Thank you for all your support with costumes and helping your children learn the songs and their lines. This week we have been busy practising for the nativity. We have also been decorating our classroom and getting into the Christmas spirit. We are changing our role play area to a nativity scene and making our own scenery and back drop. On Friday afternoon the weather was very changeable. It kept raining as well as the sun shining and we spotted a rainbow. We were very excited and we were talking about the colours we could see and how rainbows were made. The rainbow disappeared and then reappeared in a different part of the sky. We then waited for another one and some of decided to sing the rainbow song hoping that it would come back. 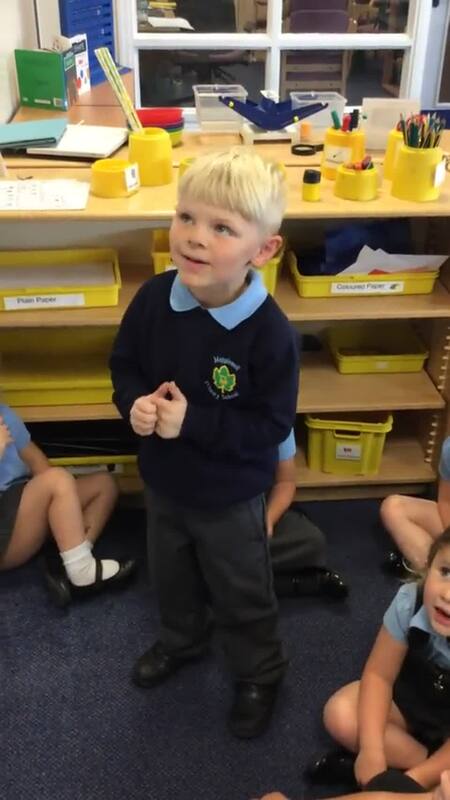 We knew that we needed rain so some children made up their own rain song too. We were so excited to then see another rainbow and we saw another rainbow very faintly in the back ground. A wonderful double rainbow which we managed to get photos of too. We have had a lovely time this week learning about the festival of Hanukkah. On Monday we were surprised to find a large present waiting for us in the classroom. After reading the story, The Hanukkah Mice, we opened the present to find a wooden dolls house and two mice. Over the next few days, more presents arrived. Each day we opened them excitedly and discovered pieces of furniture for the dolls house. It was just like the story! We have also continued to learn about Diwali and have used clay to make Diwali lamps. We can't wait to show you our finished lamps at the end of the half term. It has been such a busy week. We have had lots of fun mark making on large sheets of paper with felt-tip pens and coloured pencils. We have also continued to explore addition by combining different amounts of objects to find the total and have even found time to practice the songs for our Christmas nativity. Our singing is absolutely beautiful. This week we have had lots of fun learning more about addition. We have spent time combining different numbers of objects to find a total. In provision, we have practiced our counting by matching numerals to objects and thinking about how many we have used when we are playing. We were surprised on Monday to find bowls of water and wooden spoons in the water tray. We had lots of fun making gem cakes, fish cakes and different types of soup with our friends. This week we talked more about the seasons and what happens in Autumn. Afterwards, we created some beautiful Autumn pictures and used rich colours to represent the falling leaves. Alexia inspired us to make lollipop stick puppets after she brought one in that she had made at church. We have had lots of fun making and playing with these. In the small world area, we have explored how the different Arctic animals might interact and we have shown our caring sides when we looked after the babies in the home corner. This week we have been busy role playing about bonfires outside. We have been dressing up with extra hats and gloves, pretending to toast marshmallows and singing songs around our pretend fire. We have made our own songs up as we have been singing and this is one that we made up ourselves. We have also been making firework pictures using chalk and describing our pictures and talking about our experiences of bonfire night. We then used paint and variety of different ways to make fire work paintings. We used kitchen rolls that we adapted by snipping one end, both ends of the paintbrush as well as numicon pegs to explore the different effects we could make with the paint. We loved making swirls and mixing some the paints to look like some of the fireworks we have seen. As we painted we made some of the noises that our firework painting could make. 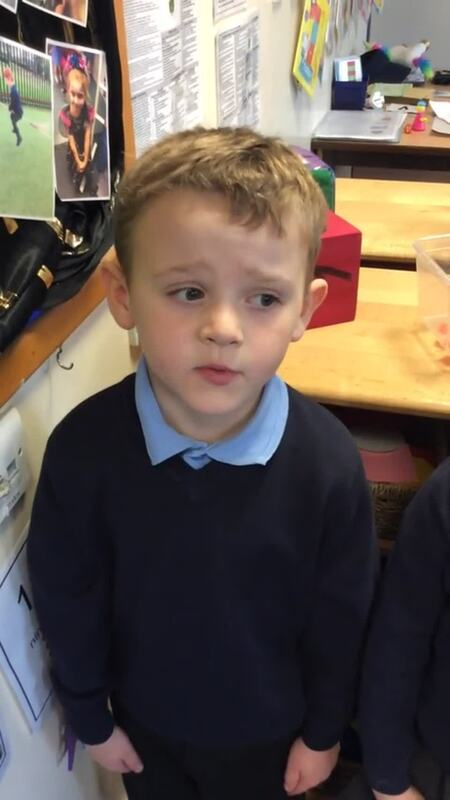 There has been lots of fabulous learning in Jackalopes class over the last two weeks. We have planted daffodil bulbs, examined spiders, ladybirds and worms and enjoyed lots of outdoor maths lessons. We also have some exciting Twitter news. 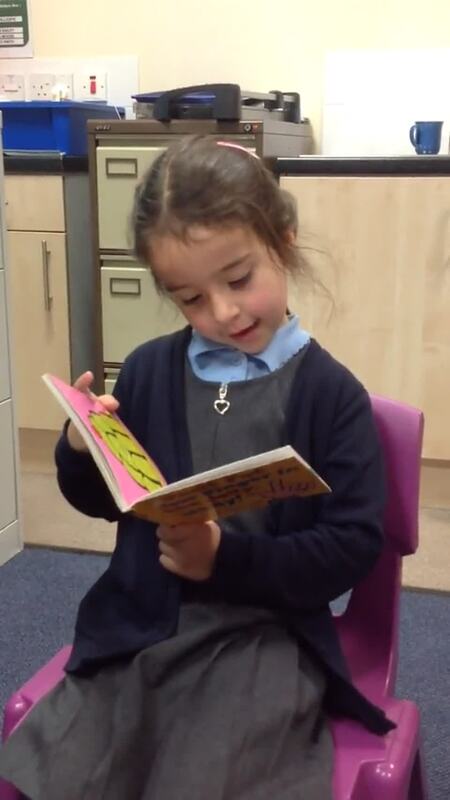 Michael Rosen has retweeted one of our pupils retelling the story 'The Bus is for Us'. It's lovely to know that authors take the time to look at what schools have been learning about. Today we had a visit from Zoolab. We had a wonderful time meeting a range of creatures including a Giant African Land Snail called Barry, a Giant African Millipede called Millie, a Chilean Rose Tarantula called Talulah, a Royal Python called Prince and a rat called Apollo. We learned lots about the different animals. Some of us held them and some of us touched them. We didn't touch Talulah the Tarantula because it would have upset her. Instead we looked closely at her. We learned what sorts of things each animal eats and how they use their senses for protection and to find food. When we got back to the classroom, lots of us chose to make spiders, snakes and rats using creative materials and play doh. We have had a wonderful day. We have had so much fun this half term and done lots of learning. We have explored using the baseboards and pegs in maths to make the different Numicon shapes. We have also enjoyed activities where we move in different ways and then get into groups of specific numbers. In the water area we had lots of fun using spoons and scoops to retrieve the objects hidden below the golden tape. We welcomed some new additions to our home corner - two babies! We have really enjoyed putting the babies to bed, dressing them and feeding them. The babies have also had lots and lots of cuddles. We have also worked hard to make sure that we treat each other kindly and use kind hands, feet and words. This week we have started to do lots of maths learning. We have sung songs and used different apparatus like number lines and the counting stick to count numbers to 10 and sometimes 20. We have also been learning more about the numbers one to five. First, we rolled the dice and used the dots to help us identify the number we had rolled. Next we found the matching number card. After that we counted out objects to represent the numeral. The adults working with us were so proud of how well we did. Our partner work was excellent and we made sure that we helped each other. 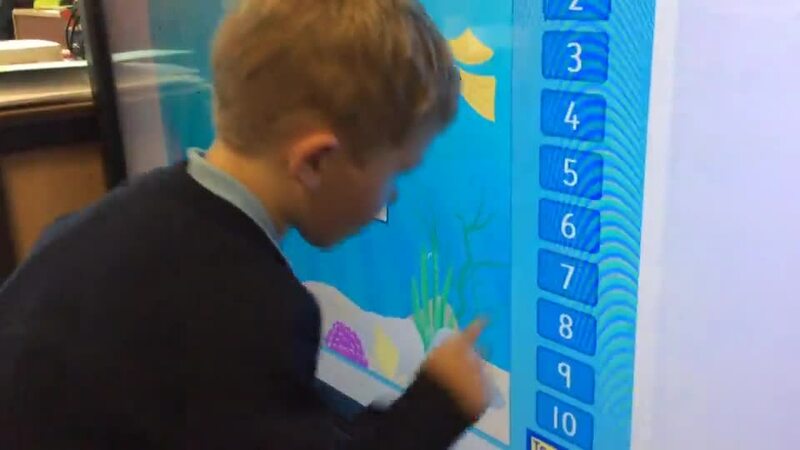 Inside the classroom we used the interactive whiteboard to play a game where we counted the spots on a ladybird and chose the correct numeral to show the number of spots. It was lots of fun. Homework 14/9/18 Read Write Inc. Please ask your child to read the sounds that they know. We will be sending a sheet home for you to practice on Monday. Our Key Story - The bus is for us! Today we have had our first PE lesson. The children practised putting on their PE kit independently and they practised doing this in silence so they could concentrate. The children did really well, some of them managed to fasten and unfasten buttons and put on tricky socks. Please practise these skills at home as this will help your child to become more independent. Some children managed to get ready in less than 10 minutes which is a great achievement for their first time. Once in the hall the children practised their good listening skills and following instructions. We played musical statues including balancing and making shapes with our bodies. 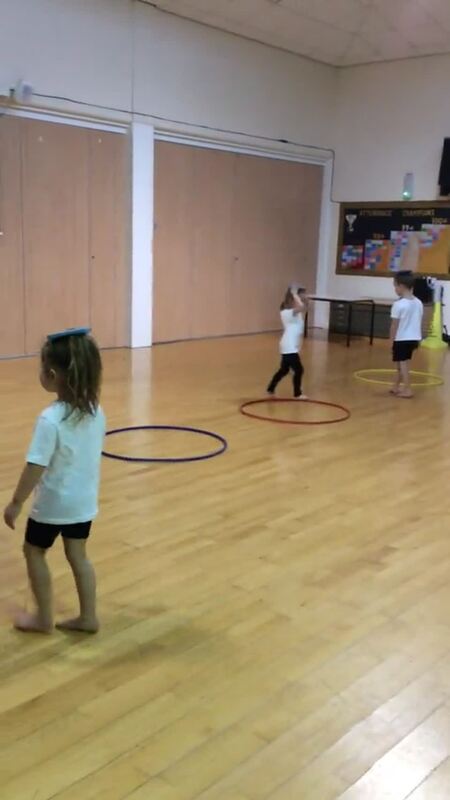 Then we played a game with the hoops where the children had to problem solve and organise themselves into pairs. Here is a slideshow of our first PE lesson. Today we have explored what a Jackalope is. The children have used their imaginations to think about what a Jackalope is, what it can do, what it's special powers are and what it likes to eat. 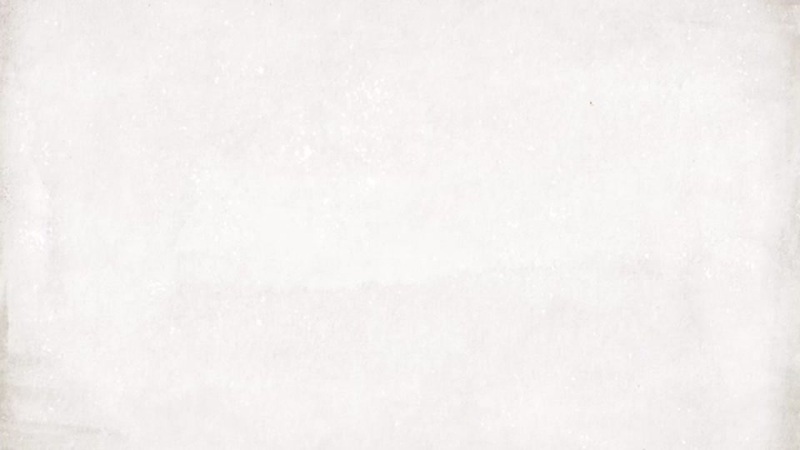 They decided that a Jackalope is 'a bit like a bunny but it can fly;' that it 'looks like a reindeer because it has horns next to its ears' and that ' it has magic feet.' Like a rabbit, a Jackalope likes to eat grass but not just any grass, special rainbow-coloured grass! Finally the children thought that the Jackalope's strong legs meant it could jump a long way like a kangaroo. The children have worked in small groups to begin creating a Jackalope mural. Today we have collaged the Jackalope itself and we hope to complete the other aspects of the picture this week. We have also created a Jackalope song so please listen out for the children singing it. In the outside area children explored building a Jackalope house. Of course the house can fly and lots of children got involved with its construction. Meanwhile inside, children had lots of fun designing their own Jackalope. They took great care to try to stay inside the lines when colouring and enjoyed telling adults about whether their Jackalope was good or naughty and the reasons why. Please practise retelling the story, 'The Bus is for Us' by Michael Rosen. Click on the images to enlarge the text map. This week has been all about buses. We have drawn buses, written text maps about buses, made junk model buses and made buses in our outdoor area. In maths we have been counting to 10. We have all had a wonderful first day at school, settling in very quickly. We have enjoyed exploring the new areas and resources. We have been busy playing and learning independently and with our peers. We have discussed our class rules and expectations. We practised going into the dinner hall for lunch and we went outside into the big playground to have a play before lunch time so that we knew what and where to go later on. It was great fun having the whole big playground to run in without the older children. We managed lunch time in the dinner hall with confidence and independence and we had a circle time after registration to talk about how lunch time went. We have continued to be interested in bees and we have been looking closely with magnifying glasses at the differences between a bee and wasp which was found on the floor outside. We were also surprised to find a very large spider who had built his web inside one of the large tyres! We read the story "The Bus Is For Us!" We talked about different ways we can travel and we drew pictures of what we could travel on and we used the large construction to make our own buses and go on holidays. We have particularly enjoyed exploring the different maths resources, using them creatively and using more mathematical language. It has been a lovely day seeing everyone getting to know each other again and saw the start of some new friendships and interests. During transition week we have been busy getting to know the children they have been learning the story "We're going on a bear hunt". We have also been busy singing and having time with each other making new friendships and for some children getting used to the new adults and classroom areas. We have been into the dinner hall and had our first experiences of eating school lunches. There have been lots of empty plates and happy faces and it has been lovely to get help from the new school lunchtime supervisors as well as some of the older children in school helping us if we are unsure of where to go. We have had quite a few bees come and visit our lavender plants and some bees have struggled in the heat so we have put a little water out in a milk bottle top to try and help encourage the bees back into the air. We know not to touch or get too close to them so we have been using binoculars and magnifying glasses to look at them from a safer distance. In September our topic is Magical Me. We are looking forward to exploring our own interests and learning all about our bodies and how we are alike and how we are all different and special in our own way. We will talk about our favourite stories and our families and people that we love. 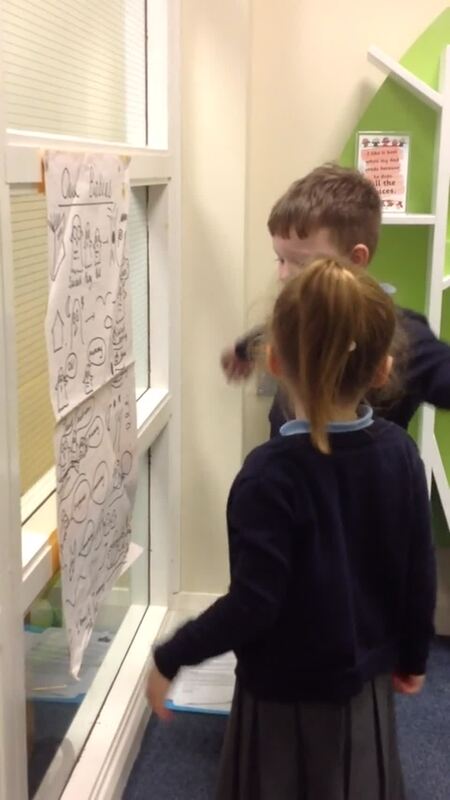 During transition week we practised 'We're going on a Bear Hunt story.' 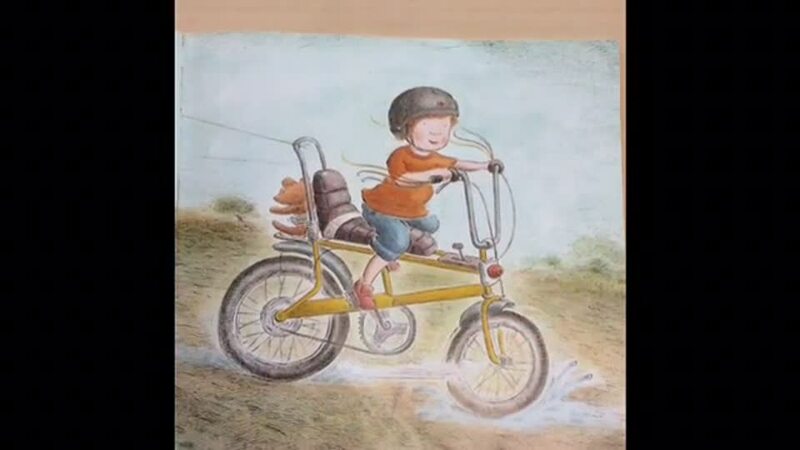 If you have this book please read it to your children over the summer and let them retell the story using the pictures from the Text Map below. Have a wonderful summer holiday.